I got a Ching-He Huang Chinese cookbook a while back and I pick it up at least once a month with the intention of giving something a whirl. This week I actually did it and had a little trip to the Chinese supermarket to get in all the supplies I didn’t have. The Chinese supermarket was great, everything was in much bigger portions and MUCH cheaper than a normal supermarket (especially for sauces and herbs and spices!!). A lot of the ingredients listed are store cupboard lovelies, so whilst you may have to buy a few things to start off with, they will last you a good while! I really fancied a new oriental dish and tastes totally different to anything else I’ve made before so if you are a fan of a good old Chinese takeaway, this is one for you. You can find Ching’s original recipe pre WW friendly adaptation here. In a bowl or jug mix all the ingredients for your sauce and give a good stir. Pop to one side. Then, place your diced chicken in a bowl, season with the salt and pepper, add the cornflour and give a good mix. Pop your rice on to cook for around 12 minutes. This should be ready at the same time as your sauce. Then take a wok or frying pan, heat over a very hot heat until the pan starts to smoke and then add the groundnut oil. Then stir in your chicken and cook until it starts to turn opaque (3 or 4 minutes). Next add your rice wine (or sherry), cook for a further two minutes and then pour in the sauce mixture. Bring sauce to the boil, add your pepper and mushrooms and cook until the chicken is cooked through and the sauce is thickened and nice and sticky. Then add your spring onions, chilli (if using) and pak choi leaves and cook for another minute. Finally drain your rice well, pop back into the pan and push to one side. In the other side, crack in an egg, scramble and then mix into the rice. Once combined, season with black pepper. Serve in a nice big bowl with your Kung Po Chicken piled onto of your lovely egg fried rice! 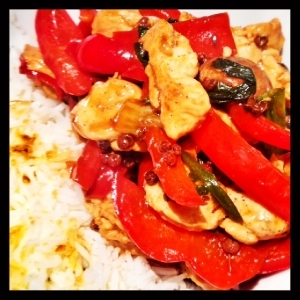 Made this tonight – yet again a fabulous recipe! Much better than the ones on the WW website, in my opinion 😀 I think I might be addicted to your recipes Laura! Ah so pleased you like them Becky! Hi, I love this recipe. However I make it to be 9SPs, not 13. Not that I’m complaining about being lighter on points!